Cytotoxic lymphocytes have the capacity to kill microbes directly; however, the mechanisms involved are poorly understood. Using Cryptococcus neoformans, which causes a potentially fatal fungal infection in HIV-infected patients, our previous studies showed that granulysin is necessary, while perforin is dispensable, for CD8 T lymphocyte fungal killing. By contrast, the mechanisms by which NK cells exert their antimicrobial activity are not clear, and in particular, the contribution of granulysin and perforin to NK-mediated antifungal activity is unknown. Primary human NK cells and a human NK cell line YT were found to constitutively express granulysin and perforin, and possessed anticryptococcal activity, in contrast to CD8 T lymphocytes, which required stimulation. When granulysin protein and mRNA were blocked by granulysin small interfering RNA, the NK cell-mediated antifungal effect was not affected in contrast to the abrogated activity observed in CD8 T lymphocytes. However, when perforin was inhibited by concanamycin A, and silenced using hairpin small interfering RNA, the anticryptococcal activities of NK cells were abrogated. Furthermore, when granulysin and perforin were both inhibited, the anticryptococcal activities of the NK cells were not reduced further than by silencing perforin alone. These results indicate that the antifungal activity is constitutively expressed in NK cells in contrast to CD8 T lymphocytes, in which it requires prior activation, and perforin, but not granulysin, plays the dominant role in NK cell anticryptococcal activity, in contrast to CD8 T lymphocytes, in which granulysin, but not perforin, plays the dominant role in anticryptococcal activity. Natural killer cells and CD8 CTL play a pivotal role in the effector arm of host defense. The ability of NK cells and CD8 T lymphocytes to kill tumor cells or infected host cells is well recognized. Furthermore, they share some common mechanisms. For example, both NK and CD8 T lymphocytes can lyse targets through the Fas-Fas ligand or the perforin-granzyme-mediated pathway (1, 2, 3). However, the mechanisms involved during one of their important functions, namely direct lymphocyte-mediated microbial killing, are still not clear. It has been shown that granulysin, a product of cytotoxic lymphocytes, is capable of killing or inhibiting the growth of microbes (4). Granulysin is a member of the saposin-like protein family that includes amoebapores, pulmonary surfactant protein B, saposin, and NK lysin (5). Granulysin is located in the cytotoxic granules of NK cells and CD8 T lymphocytes and exists in 15- and 9-kDa forms (6, 7). Granulysin interacts with the lipid components in the cell membrane, leading to the osmotic lysis of microbial targets or apoptosis of mammalian cells (8, 9). Our previous observations, using Cryptococcus neoformans, which is one of the most common life-threatening fungal infections in patients who have compromised cell-mediated immunity, including AIDS (10, 11, 12), indicated that granulysin is required for the CD8 T lymphocyte-mediated direct antifungal activity (13). The granulysin (519) gene is also constitutively expressed in NK cells (14), and in fact was cloned as NKG5 (15, 16), and NK cells constitutively express granulysin transcripts; consequently, we felt that granulysin was the likely mechanism for the NK cell-mediated antimicrobial activity. However, CD8 CTL and NK cells also express perforin, a calcium-dependent pore-forming protein, which is an important component of granule exocytosis and cell-mediated cytotoxicity. Perforin entry into the tumor target cell membrane creates a signal for the target cell to repair the damage by endocytosing the perforin and surrounding plasma membrane (17). Granzymes (distinct from granulysin) in the vicinity of the lesion are also endocytosed and ultimately delivered into the target cell cytoplasm and nucleus, where they deliver proapoptotic signals and induce target cell death (17). Perforin-mediated cytotoxicity is well documented in NK cell-mediated defense against host cells infected with several types of viruses (18, 19, 20, 21, 22, 23), bacteria (24), and parasites (25). However, the role of perforin in NK-mediated direct antimicrobial activity, in which the NK cell is directly in contact with the pathogen, which is then killed by NK cells, is not clear. Our previous observations indicated that granulysin is required for human CD8 T lymphocyte-mediated direct anticryptococcal activity (13). We were unable to demonstrate that perforin made any contribution to this activity (13). By contrast, previous studies have shown that murine NK cell-mediated anticryptococcal activity is due to cytolysin or perforin (26). Because no murine homologue to granulysin has been identified, it may be that murine cells use perforin as an alternate mechanism to granulysin that is used by human CD8 CTL. As CD8 CTL and NK cells share common cytolytic mechanisms, we questioned whether human NK cells might use granulysin as human CD8 T lymphocytes do, or whether human NK cells might use perforin as the effector mechanism as do mouse NK cells. C. neoformans CAP 67 (ATCC 52817, acapsular mutant of 3501) was obtained from the American Type Culture Collection (Manassas, VA). The organisms were maintained on Sabouraud’s dextrose slants (Difco, Detroit, MI) and passaged to fresh slants every month, as previously described (27). YT cells were obtained from C. Clayberger (Stanford University, Stanford, CA) as a gift, and cultured in medium containing RPMI 1640, 10% FCS, 100 U/ml penicillin, 100 μg/ml streptomycin, 2 mM l-glutamine, 1 mM sodium pyruvate, and 0.1 mM nonessential amino acids (all from Invitrogen Life Technologies, Burlington, Canada). Primary NK cells were isolated from PBMC. PBMC were prepared, as described previously (28). Briefly, peripheral blood was obtained by venipuncture from healthy adults who had no history of cryptococcosis and had not worked with C. neoformans. PBMC were isolated by centrifugation (800 × g, 20 min) over a Ficoll-Hypaque density gradient (C-SIX Diagnostics, Mequon, WI). PBMC were harvested and washed three times in HBSS (Invitrogen Life Technologies) and then resuspended in medium containing RPMI 1640 (Invitrogen Life Technologies), 5% human AB serum (BioWhittaker, Walkersville, MD), 100 U/ml penicillin, 100 μg/ml streptomycin, 2 mM l-glutamine, 1 mM sodium pyruvate, and 0.1 mM nonessential amino acids (all from Life Technologies). NK cells were isolated from PBMC by the MACS negative selection system using the NK cell isolation kit (Miltenyi Biotec, Bergisch Gladbach, Germany). The purity of NK cells was greater than 90%, as determined by flow cytometry using PerCP-labeled Abs to CD3 and FITC-labeled Abs to CD56 (BD Biosciences, Mountain View, CA). CD8 T cells were prepared, as previously described (13). For some experiments, NK cells were treated with 25 mM strontium chloride (Sigma-Aldrich, St. Louis, MO) for 24–48 h (29, 30), or 10 nM concanamycin A (Sigma-Aldrich) for 2 h, or 2 mM EGTA (Sigma-Aldrich) for 12 h. The cells were washed three times in medium and placed in culture for the experiment. The viability of cells was not altered by these treatments, as assessed by trypan blue exclusion. To determine whether direct cell contact is required for anticryptococcal activity of YT cells, a cell culture insert (BD Discovery Labware, Franklin Lake, NJ) was put into the wells of 24-well culture plates. Wells of the plate have two chambers separated by a polycarbonate membrane of cell culture insert with a pore size of 0.45 μm. C. neoformans was placed in the upper chamber, and YT cells were placed in the lower chamber at a series of ratios to cryptococcal cells: 102:1, 103:1, 104:1, 105:1, and cultured for 24 and 48 h. The effect on C. neoformans growth was determined, as described below. Cells were lysed in a lysis buffer (50 mM Tris, pH 6.8, 1% SDS, 0.025% bromphenol blue, 10% glycerol, 20 mM DTT). The nuclei were removed by centrifugation at 10,000 × g for 30 min. Protein from the lysates of 5 × 105 cells was loaded in each lane of a 16% Tris-glycine gel (Invitrogen Life Technologies), separated by electrophoresis, transferred to a nitrocellulose membrane (Bio-Rad, Hercules, CA), and blotted with polyclonal anti-granulysin Ab 519/GST rabbit serum (1/1000 dilution) (4). The reactive bands were visualized using HRP-conjugated anti-rabbit IgG (1/5000 dilution) (Santa Cruz Biotechnology, Santa Cruz, CA) with the ECL plus Western blotting detection system (Amersham Biosciences, Piscataway, NJ). The membranes were then labeled with a mouse anti-β actin mAb (Chemicon International, Temecula, CA), and bands were detected, as described above. For the detection of perforin, the membranes were blotted with a polyclonal anti-perforin Ab (Research Diagnostic, Flanders, NJ) (1/1000 dilution), and the bands were visualized, as described above. The sequence and synthesis of granulysin siRNA, CD20 siRNA, and nonsilencing siRNA duplexes have been previously described (13). YT cells were transfected by electroporation (Bio-Rad). To design perforin target-specific siRNA, we used a hairpin siRNA system (Ambion, Austin, TX). Briefly, we selected a sequence of the type AA (N19) (N, any nucleotide) from the open reading frame of the perforin mRNA. The sequence that was targeted for perforin siRNA was from position 481–501 (accession number in GenBank: M28393). The selected AA(N19) sequence was submitted to a BLAST search against the human genome sequence to ensure that only one gene was targeted. Then the N19 sequence was put into double-strand hairpin siRNA insert frame (designed by Ambion): strand 1, 5′-N(19) (sense) TTCAAGAGA N(19) (antisense) TTTTTT-3′ (53 bp); strand 2, 3′-CCGG N(19) (antisense) AAGTTCTCT N(19) (sense) AAAAAATTAA-5′ (61 bp); two strands of oligonucleotides were separately synthesized (Sigma-Aldrich). The perforin hairpin siRNA insert was made by annealing the two oligonucleotide strands together. The annealing reaction was performed by mixing 2 μl of each oligonucleotide with 46 μl of annealing buffer and incubating the mixture at 90°C for 3 min, followed by 37°C for 1 h. The vector pSilencer 1.0-U6 (Ambion) was digested with EcoRI and ApaI (New England Biolabs, Beverly, MA), and the hairpin siRNA was ligated into the vector following the manufacturer’s instructions. The vector alone was used as the control. DNA from the perforin siRNA vector or the negative control ligation reaction was transformed into competent Escherichia coli by heat shock at 42°C. To select positive clones that contain the siRNA insert, clones were identified by sequencing the cloning site using a T3 primer (University Core DNA Services, University of Calgary, Calgary, Canada). Perforin siRNA vector or vector alone was transfected into YT cells by electroporation using 5–20 μg of DNA. Total RNA was extracted from individual cell samples using an RNA extraction kit (Qiagen, Chatsworth, CA). The extracted total RNA was quantified fluorometrically using the SYBR Green II fluorescent RNA dye (Molecular Probes, Eugene, OR) on an LS-5 fluorescence spectrofluorometer (PerkinElmer, Wellesley, MA) with excitation at 468 nm and emission at 525 nm using a standard curve of rRNA (Sigma-Aldrich). One microgram of total RNA from each sample was reverse transcribed using a Stratagene RT-PCR kit (Stratagene, La Jolla, CA), following the manufacturer’s instructions. The granulysin-specific primers were: sense, 5′-CATATGCATATGGGCCGTGACTACAGGACCTGTC-3′; antisense, 5′-GGATCCGGATCCTTACCTGAGGTCCTCACAGATCTG-3′ (31). The perforin-specific primers were: sense, 5′-ATGTAACCCGGGCCAAAGTCA-3′; antisense, 5′-GTGCCGTAGTTGGAGATAAGC-3′ (32). The human GAPDH-specific primers were: sense, 5′-TCACCATCTTCCAGGAGCGA-3′; antisense, 5′-AGTGATGGCATGGACTGTGG-3′. The PCR profile for granulysin and GAPDH was: denaturation at 94°C for 1 min, followed by 25 cycles of denaturation at 94°C for 30 s, annealing at 55°C for 30 s, and extension at 72°C for 1 min. A final extension at 72°C for 10 min was used. The PCR profile for perforin was: 94°C for 5 min, 60°C for 5 min, followed by 32 cycles of 90 s at 72°C, 45 s at 94°C and at 60°C, and a final extension period of 10 min at 72°C. The number of cycles was adjusted so that amplification occurred over the linear range. The PCR products were separated by electrophoresis on a 2% agarose gel and visualized by ethidium bromide staining. The gels were then photographed using Polaroid Type 55 Land film and analyzed by densitometry (MasterScan Interpretive Densitometer and RFLPscan; Scanalytics/CSP, Fairfax, VA). Integrated density values were normalized to GAPDH values to yield a semiquantitative assessment of individual transcript levels. A CFU assay was performed, as previously described (33, 34, 35). C. neoformans (2 × 103/well) were incubated with or without YT cells (E:T = 200:1 to 500:1, unless otherwise specified). The number of CFU of C. neoformans per well was determined at 0, 24, or 48 h by lysing the effector cells with 0.1% Triton X-100, followed by diluting and spreading onto Sabouraud’s dextrose agar plates. Preliminary experiments established that this concentration of Triton X-100 lysed effector cells without affecting fungal growth. Results are expressed as the number of growth of C. neoformans. An increase in the number of C. neoformans compared with the inoculum indicates proliferation. Values lower than the inoculum indicate killing. Values are expressed as mean ± SEM for quadruplicate samples. Approximately 15 donors were used for these studies. Experiment was performed on different donors and on different days. Statistical analysis was performed by using the ANOVA. For this purpose, the Fisher least-squares difference was used when allowed by the F test. Student’s t test was used further to do the pairwise comparison using the Bonferroni correction. For these tests, p < 0.05 was considered significant. To determine whether primary NK cells and YT cells, a human NK cell line, express granulysin, perforin, and anticryptococcal activity, primary NK cells and YT cells were lysed, and granulysin and perforin were detected by immunoblot. Perforin and both the 15- and 9-kDa forms of granulysin were expressed in primary NK cells and YT cells (Fig. 1⇓A). Moreover, the level of perforin and granulysin expression in YT cells was similar to that in primary NK cells (Fig. 1⇓A). By contrast, CD8 T cells did not express perforin or granulysin constitutively, but did express these products after stimulation with IL-15. YT cells and primary NK cells constitutively expressed granulysin, perforin, and anticryptococcal activity, but CD8 T cells did not. A, Immunoblot for granulysin and perforin in resting YT cells, primary NK cells, and resting and stimulated CD8 T cells (50 ng/ml IL-15). B, Different number of YT cells were added to C. neoformans, from E:T = 10:1, 100:1, 200:1, to 500:1. The growth of C. neoformans was determined. C, C. neoformans was added to YT cells (C + YT) or primary NK cells (C + primary NK) and compared with the growth of C. neoformans alone (Crypto alone) at 24 and 48 h. D, C. neoformans was added to resting primary CD8 T cells (US-CD8) or IL-15-stimulated CD8 T cells (IL-15-CD8) and compared with the growth of C. neoformans alone (Crypto alone). Results are expressed as mean ± SEM. ∗, p < 0.05 compared with the growth of C. neoformans alone. The experiment was repeated three times with similar results. To determine the anticryptococcal activity of YT cells, experiment was performed at a series of E:T ratios. YT cells showed anticryptococcal activity at E:T = 10:1, 100:1, 200:1, and 500:1. To determine whether YT cells and primary NK cells possess anticryptococcal activity, the growth of C. neoformans cultured with YT cells or primary NK cells was compared with the growth of C. neoformans alone. When C. neoformans was placed in culture without NK cells, there was a 180% increase in the number of organisms after 24 h and >400% at 48 h. When C. neoformans was cultured with YT cells or primary NK cells, there was a significant anticryptococcal effect. In these cultures, the number of organisms at 24 and 48 h was lower than the starting inoculum (Fig. 1⇑C), indicating that YT cells constitutively express fungicidal activity and killed C. neoformans. Likewise, there was no statistical difference between the anticryptococcal activity of YT cells and the anticryptococcal activity of primary NK cells (Fig. 1⇑C). By contrast, CD8 T cells did not constitutively express anticryptococcal activity, but acquired this ability after stimulation with IL-15 (Fig. 1⇑D). It was not clear whether the lymphocyte-mediated anticryptococcal activity required cell contact between the lymphocytes and microbes, or whether it was mediated by soluble factors released by the lymphocytes. To address the dependence on cell contact, experiments were performed using a polycarbonate membrane containing 0.45-μm pores within a cell culture insert. YT cells were placed above the membrane, and C. neoformans was put in the culture well below the membrane, which allowed the nutrients and soluble factors in the medium to exchange between the insert and culture well freely. When YT cells were in contact with C. neoformans in the culture (C + YT), the number of organisms was lower than the initial inoculum, indicating that C. neoformans was killed by the effector cells (Fig. 2⇓A). By contrast, when the YT cells were separated from the C. neoformans by the membrane (C/YT), the number of C. neoformans dramatically increased after 24 and 48 h of culture and was even higher than the group containing C. neoformans alone (Fig. 2⇓A). This effect reached statistical significance when high E:T ratio >1000:1 was used (Fig. 2⇓B). Thus, YT cells required contact with C. neoformans to exert their anticryptococcal activity. However, contact may be required during two stages of the killing process. Contact with C. neoformans may be required to signal the NK cell to be activated, and this activation might then be required to express the cytotoxic activity. Alternatively, contact might be required to transfer the cytotoxic molecules to the targets. To address these possibilities, YT cells were stimulated with C. neoformans on one side of the culture insert, and the target, C. neoformans alone, was place on the other side (C/(C + YT)). Without direct cell contact, there was no inhibition of growth of target C. neoformans; indeed, the growth was similar to the growth of C. neoformans that had been separated from YT cells by the culture insert (Fig. 2⇓A). Thus, stimulation of YT cells did not lead to the secretion of soluble cytotoxic factors that act independent of cell contact. Rather, these results suggest that cell contact is required for the transfer of cytotoxic molecules to the microbial target. The anticryptococcal activity of YT cells was cell contact dependent. A, YT cells and C. neoformans (E:T ratio = 1000:1) were separated by a cell culture insert (C/YT). The growth of C. neoformans separated from YT cells (C/YT) was compared with that of C. neoformans cultured together with YT cells in the culture well (C + YT), or compared with that of C. neoformans in the culture well and YT plus C. neoformans in the culture insert (C/(C + YT)) or compared with C. neoformans alone (Crypto alone). B, C. neoformans was separated from YT cells by a cell culture insert at a series of ratios (E:T = 102:1, 103:1, 104:1, 105:1) for 24 and 48 h. C, YT cells and C. neoformans were cultured together in the culture well at same ratios and time points. D, YT cells and C. neoformans were cultured in the cell culture insert and C. neoformans in the culture well at the above ratios and time points. Results are expressed as mean ± SEM. ∗, p < 0.05 compared with the growth of C. neoformans alone. The experiment was repeated three times with similar results. To confirm the results we obtained in Fig. 2⇑A, each condition was performed at different E:T ratios. C. neoformans and YT cells were separated by the culture insert (C/YT) (Fig. 2⇑B) or C. neoformans were cultured with YT cells together (C + YT) (Fig. 2⇑C), or YT cells were stimulated with C. neoformans on one side of the membrane and the growth of C. neoformans on the other side of the membrane was determined (C/C + YT) (Fig. 2⇑D). A dose-dependent effect was seen in all conditions. After observing that YT cells constitutively expressed granulysin, perforin, and anticryptoccoal activity, experiments were performed to determine whether these constituents of cytotoxic granules were required for the anticryptococcal activity. SrCl2, which depletes the granule components of cytotoxic lymphocytes without causing cellular toxicity, was used (36, 37). 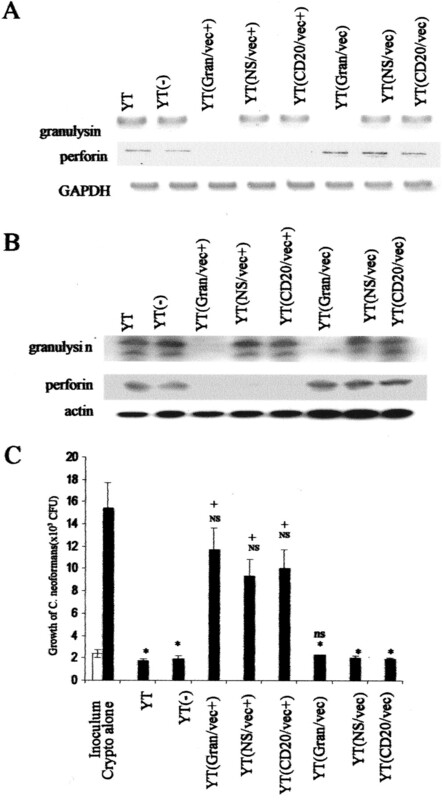 After YT cells were treated with SrCl2, granulysin and perforin were depleted (Fig. 3⇓A). Correspondingly, the anticryptococcal activity was abrogated (Fig. 3⇓B). Thus, depletion of cytotoxic granules containing granulysin and perforin abrogated the anticryptococcal activity of YT cells. Depletion of granules reduced the anticryptococcal activity of YT cells. A, YT cells were not treated (YT) or treated with SrCl2 (YT-Sr2+). Granulysin and perforin were detected by immunoblot. B, The growth of C. neoformans in the presence of YT cells (C + YT), YT cells treated with SrCl2 (C + YT-Sr2+), or SrCl2 (C + Sr2+) was compared with the growth of C. neoformans alone (Crypto alone). Results are expressed as mean ± SEM. ∗, p < 0.05 compared with the growth of C. neoformans alone. The experiment was repeated three times with similar results. Because the anticryptococcal activity of YT cells depended on cytotoxic granules, and having previously demonstrated that granulysin was necessary for CD8 T cell-mediated anticryptococcal activity (13), experiments were performed to determine whether granulysin was necessary for YT cell-mediated anticryptococcal activity. To specifically interfere with granulysin, RNA interference (RNAi) was used. YT cells were transfected by electroporation with granulysin-specific siRNA. As controls, YT cells were transfected with siRNA to CD20, nonsilencing siRNA, or sham transfection. CD20 is expressed by B cells, but not by NK cells. Granulysin mRNA expression was determined by semiquantitative RT-PCR. In YT cells treated with siRNA to granulysin, granulysin mRNA was dramatically decreased compared with control siRNA (CD20 siRNA, and nonsilencing siRNA) or sham-transfected cells (Fig. 4⇓A). By contrast, perforin mRNA was not affected by transfection of granulysin siRNA (Fig. 4⇓A). Gene silencing of granulysin in YT cells did not affect the anticryptococcal activity. A, Granulysin steady state mRNA was assessed by RT-PCR from YT cells alone without electroporation (YT), or YT cells sham electroporated without siRNA (YT−), or YT cells transfected by electroporation with granulysin siRNA (YT(Gran)), or with CD20 siRNA (YT(CD20)), or with nonsilencing siRNA (YT(NS)) after transfection for 24 and 48 h. Perforin mRNA level was assessed by RT-PCR to determine whether granulysin siRNA transfection would affect perforin. B, Granulysin was detected by immunoblot from the same groups. C, The anticryptococcal activity of YT cells (C + YT), or YT cells sham transfected (C + YT−), or YT cells transfected with granulysin siRNA (C + YT(siRNA)), or nonsilencing siRNA (C + YT(NS)), or CD20 siRNA (C + YT(CD20)) was compared with the growth of C. neoformans alone (Crypto alone). Results are expressed as mean ± SEM. ∗, p < 0.05 compared with the growth of C. neoformans alone. NS, not significant compared with the growth of C. neoformans in the presence of YT cell sham-transfected (C + YT−) group. The experiment was repeated three times with similar results. To determine whether granulysin protein expression was also reduced, YT cells were transfected with siRNA and granulysin was detected by immunoblot. Granulysin protein expression was significantly decreased in the group transfected with granulysin siRNA, but not affected in the control groups (Fig. 4⇑B). After demonstrating that expression of granulysin was inhibited at both the level of mRNA and protein, experiments were performed to determine the effect of blocking granulysin on the anticryptococcal activity. YT cells were transfected with granulysin siRNA or control siRNA, and challenged with live C. neoformans. We were surprised to find that YT cells transfected with granulysin siRNA still possessed anticryptococcal activity, and the anticryptococcal activities were not significantly different from that of the control groups (Fig. 4⇑C). Therefore, these results indicate that inhibition of granulysin did not affect the anticryptococcal activity of YT cells, in contrast to human CD8 CTL-mediated anticryptococcal activity that is dependent on the granulysin (13). After demonstrating that granulysin was not responsible for the anticryptococcal activity of YT cells, experiments were performed to determine whether perforin was required for the anticryptococcal activity of YT cells. Two methods were used to block perforin expression. First, perforin was inhibited by concanamycin A. Concanamycin A, an inhibitor of the vacuolar ATPase that is required to maintain perforin in lytic granules (38), has been shown to selectively inhibit perforin-mediated T lymphocyte cytotoxicity for alloantigen-specific targets (38). 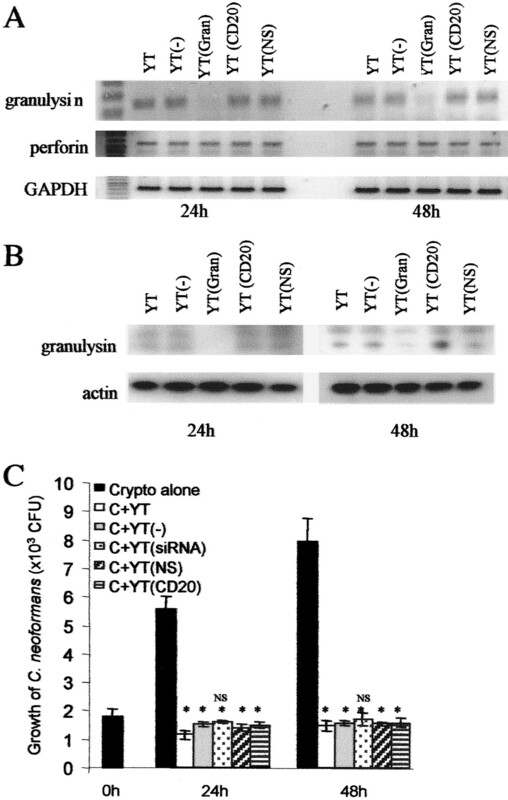 YT cells treated with concanamycin A showed reduced anticryptococcal activity (data not shown), suggesting that the perforin-mediated cytotoxic pathway is important for the anticryptococcal activity of YT cells. Correspondingly, immunoblotting revealed that perforin was decreased (but not completely inhibited) by concanamycin A treatment (data not shown). Unfortunately, higher concentrations of concanamycin A (e.g., 100 nM) that might reduce perforin to a greater extent inhibited the growth of C. neoformans, which prohibited testing the anticryptococcal activity. In an attempt to inhibit perforin more specifically and more completely, hairpin siRNA was used. YT cells that were transfected with a perforin siRNA-positive vector were compared with cells transfected with the vector alone as a control. The expression of perforin mRNA was determined by RT-PCR. Perforin mRNA was dramatically decreased in YT cells transfected with the perforin siRNA-containing vector compared with YT cells transfected with the vector alone or sham transfected (Fig. 5⇓A). By contrast, granulysin mRNA expression was not affected (Fig. 5⇓A). Gene silencing of perforin in YT cells decreased the anticryptococcal activity. A, Perforin steady state mRNA was assessed by RT-PCR from YT cells alone without electroporation (YT), or YT cells sham electroporated without vector (YT(−)), or YT cells transfected by electroporation with perforin siRNA-positive vector (YT(vec+)), or with vector alone (YT(vec)) after transfection for 24 and 48 h. Granulysin mRNA level was also assessed by RT-PCR to determine whether perforin siRNA vector transfection would affect granulysin. B, Perforin was detected by immunoblot from above groups. 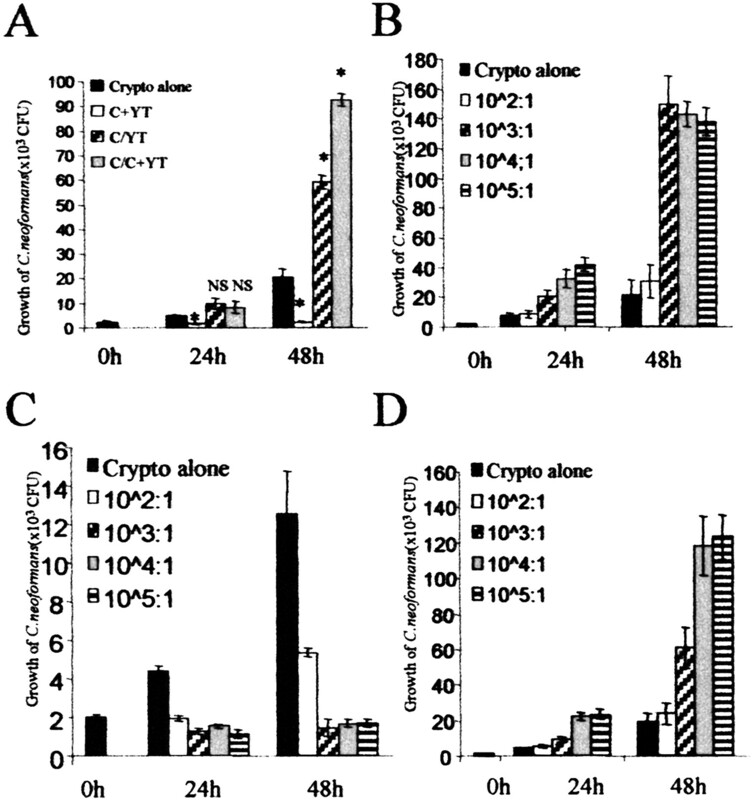 C, The growth of C. neoformans in the presence of untreated YT cells (C + YT), or YT cells that had been sham transfected (C + YT(−)), or YT cells transfected with perforin siRNA vector (C + YT(vec+)), or transfected with vector alone (C + YT(vec) was compared with the growth of C. neoformans alone (Crypto alone). Results are expressed as mean ± SEM. ∗, p < 0.05 compared with the growth of C. neoformans alone. +, p < 0.05 compared with the growth of C. neoformans in the presence of YT cells that had been sham transfected (C + YT(−)). The experiment was repeated three times with similar results. To determine whether perforin protein expression was reduced, YT cells were transfected with hairpin siRNA and perforin was detected by immunoblot. Perforin expression was dramatically decreased in the cells treated with perforin siRNA, but not affected in the group treated with the vector alone or in the sham-transfected group (Fig. 5⇑B). After demonstrating that the expression of perforin was decreased at both the level of mRNA and protein expression, experiments were performed to determine the effect of blocking perforin on the anticryptococcal activity. YT cells were transfected with the perforin siRNA-positive vector or vector alone and challenged with live C. neoformans. In contrast to the granulysin inhibition, blocking perforin significantly reduced the anticryptococcal activity of YT cells compared with the group treated with the vector alone (Fig. 5⇑C), suggesting that perforin plays a dominant role in YT cell-mediated anticryptococcal activity. This is in contrast to human CD8 T lymphocyte-mediated anticryptococcal activity, in which blocking perforin with concanamycin A had no significant effect (13). We have tried to use hairpin siRNA to extend these results to primary NK cells, but due to the low transfection efficiency, perforin was not successfully inhibited (data not shown). Thus, experiments were performed to inhibit perforin with concanamycin A and EGTA, which chelates calcium and blocks perforin polymerization. When primary NK cells were treated with concanamycin A (Fig. 6⇓A) or EGTA (Fig. 6⇓B), the anticryptococcal activity was dramatically reduced, suggesting perforin is the mechanism by which primary NK cells mediate their anticryptococcal activity as it is in YT cells. Inhibition of perforin with concanamycin A or EGTA decreased the anticryptococcal activities of primary NK cells. A, The growth of C. neoformans in the presence of primary NK cells (C + NK), or NK cells treated with concanamycin A (C + NK-CMA), or concanamycin A (C + CMA) was compared with the growth of C. neoformans alone (Crypto alone). 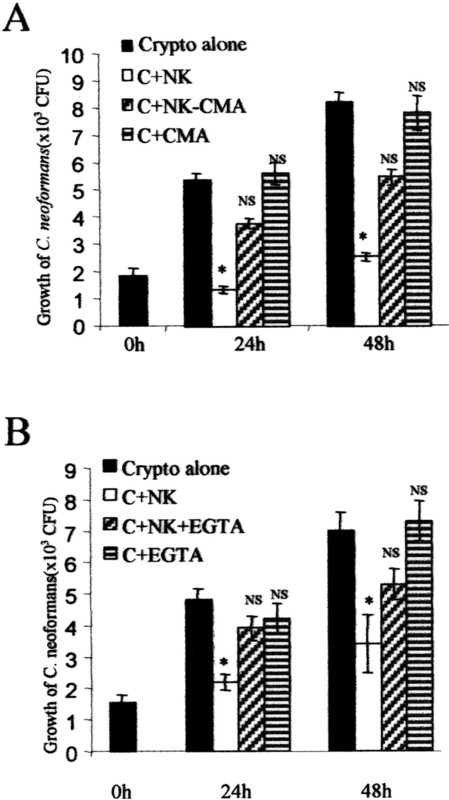 B, The growth of C. neoformans in the presence of primary NK cells (C + NK), or NK cells treated with EGTA (C + NK-EGTA), or EGTA (C + EGTA) was compared with the growth of C. neoformans alone (Crypto alone). Results are expressed as mean ± SEM. ∗, p < 0.05 compared with the growth of C. neoformans alone. The experiment was repeated three times with similar results. Having observed that inhibition of perforin, but not granulysin, affected the anticryptococcal activity of YT cells, experiments were performed to determine whether a role for granulysin might be revealed when perforin was compromised by blocking its expression. YT cells were cotransfected with both granulysin siRNA and the perforin siRNA-positive vector, or different combinations of controls of granulysin siRNA and the perforin siRNA-negative vector. The efficiency of inhibition for granulysin and perforin was determined at both the mRNA and protein level by RT-PCR and immunoblot, respectively. Perforin was inhibited at both levels in YT cells transfected with the perforin siRNA-positive vector plus granulysin siRNA, or the positive vector plus granulysin control siRNAs (CD20 siRNA, nonsilencing siRNA). Granulysin was also inhibited in YT cells transfected with granulysin siRNA plus the perforin siRNA-positive vector, or plus the control vector (Fig. 7⇓, A and B). Other control combinations (CD20 siRNA plus vector alone, nonsilencing siRNA plus vector alone) had no effect on the expression of granulysin or perforin (Fig. 7⇓, A and B). Gene silencing of both granulysin and perforin did not decrease the anticryptococcal activity of YT cells compared with that of silencing perforin alone. A, Granulysin and perforin mRNA were assessed by RT-PCR from YT cells alone (YT), or YT cells that had been sham transfected (YT(−)), or YT cells transfected with granulysin siRNA plus perforin siRNA-positive vector (YT(Gran/vec+)), or with nonsilencing siRNA plus perforin siRNA-positive vector (YT(NS/vec+)), or with CD20 siRNA and perforin siRNA-positive vector (YT(CD20/vec+)), or with granulysin siRNA plus vector alone (YT(Gran/vec)), or with nonsilencing siRNA plus vector alone (YT(NS/vec)), or with CD20 siRNA plus vector alone (YT(CD20/vec)). B, Granulysin and perforin protein were detected by immunoblot from above groups. C, The growth of C. neoformans in the presence of the above groups was compared with the growth of C. neoformans alone (Crypto alone). Results are expressed as mean ± SEM. ∗, p < 0.05 compared with the growth of C. neoformans alone. +, p < 0.05 compared with the growth of C. neoformans in the presence of YT cell sham-transfected (C + YT(−)) group. The experiment was repeated three times with similar results. Experiments were performed to determine the anticryptococcal activities of the groups described above. The anticryptococcal activity of YT cells treated with both granulysin and perforin siRNA was dramatically decreased. There was no difference between the anticryptococcal activity of sham-transfected YT cells and the group treated with granulysin siRNA (Fig. 7⇑C). Thus, the presence or absence of granulysin did not affect the anticryptococcal activity, suggesting perforin functions independent of granulysin. Moreover, the double transfection of perforin siRNA-positive vector and granulysin siRNA did not reduce anticryptococcal activity further compared with the cells treated with perforin siRNA-positive vector alone (Fig. 7⇑C). Together, these findings suggest that granulysin does not contribute substantially to the anticryptococcal activity of YT cells. We have made four observations: 1) human primary NK cells and a human NK cell line (YT cells) constitutively express granulysin, perforin, and anticryptococcal activity; 2) the anticryptoccal activity requires cell contact, degranulation of the NK cell line with Sr2+ abrogates the anticryptococcal activity, but blocking expression of granulysin has little effect on the anticryptococcal activity; 3) perforin is required for the anticryptococcal activity of primary NK cells and an NK cell line; 4) perforin-mediated anticryptococcal activity is independent of granulysin, and no effect of granulysin is revealed in the absence of perforin. It has been reported that NK cells constitutively express the granulysin gene NKG5 (16), and that human NK cells highly express the transcripts for granulysin, perforin, granzyme B, and α-defensin 1 (14). To determine the mechanism of cytotoxicity of NK cells, a human NK cell line, YT cells, was used. In the current study, we demonstrated granulysin, perforin, and anticryptococcal activity in the YT cell line. Furthermore, the perforin and granulysin protein levels were similar in human primary NK cells and YT cells, as was the anticryptococcal activity. NK cells are considered to have two major functions. One is to directly interact with and kill target cells such as virus-infected cells, tumor cells, other host cells, and some pathogenic microorganisms (39). Alternately, there are a number of mechanisms by which NK cells enhance host defense via the production of soluble factors. NK cells function to produce cytokines that can modulate innate and adaptive immune responses (40, 41, 42). YT cells are known to secrete high levels of granzyme B into the culture supernatant (43), and NK cells release small amounts of perforin into the culture medium (44). Therefore, experiments were performed to determine whether soluble factors or direct cell contact are responsible for the anticryptococcal activity. When the YT cells were separated from the C. neoformans, YT cells completely lost their anticryptococcal activity, suggesting that the YT cell-mediated antifungal activity is not due to soluble factors, but rather, it is contact dependent. This is consistent with previous studies that observed direct contact between human T cells, human NK cells, or mouse NK cells with C. neoformans by microscopic techniques (45, 46, 47, 48, 49). The importance of cell contact and the magnitude of the anticryptococcal activity are further emphasized by the observation that the growth of C. neoformans increased as the number of YT cells was increased on the other side of the membrane. These experiments revealed that YT cells produce a soluble factor that potentiates the growth of C. neoformans. The positive effect on growth produced by this factor must be counteracted by contact-dependent cytotoxic activity against the fungus. These data raise the possibility that perforin would have an even greater effect in the absence of YT cells; however, these conditions would not arise in vivo in which perforin is cell derived. To study the role of granulysin and perforin, which are both intracellular molecules, it was necessary to apply a new technique to specifically inhibit granulysin and perforin without affecting the other contents of the cytotoxic granules. RNAi is a posttranscriptional gene-silencing method that was initially applied with success in Caenorhabditis elegans (50, 51, 52), plants (53, 54), Drosophila melanogaster (55, 56), and Trypanosoma brucei (57). The siRNA, short RNA duplex (21-nt RNA), has been applied in the mammalian system (58). Thus, siRNA gene silencing provides an opportunity to inhibit granulysin and perforin in our system. We previously showed that granulysin, a lytic peptide in the cytotoxic granule, is necessary for the anticryptococcal activity of human CD8 CTL. When YT cells were treated with strontium ions, the antifungal effect of YT cells was abrogated. This is similar to the observation in human CD8 CTL (13). In this regard, CD8 T cells and NK cells are similar. On the basis of these observations, experiments were performed to determine whether granulysin is also required for human NK cell-mediated anticryptococcal activity. However, when granulysin was specifically inhibited by granulysin siRNA at both the mRNA and the protein level, the anticryptococcal activity of YT cells was not significantly affected. These data are in direct contrast to CD8 CTL. Previous studies indicated that impaired granulysin expression in NK cells in tumor patients correlated with progression of cancer (59). This suggests that granulysin plays different roles in the NK-mediated antimicrobial activity and antitumor activity. It has been reported that mouse NK cells have direct anticryptococcal activity (60), and this activity is mainly due to cytoplasmic components of the granule fraction, especially cytolysin (perforin) (26). After we observed that granulysin did not contribute to the anticryptococcal activity of YT cells, experiments were performed to determine whether the anticryptococcal activity was due to perforin. When perforin was inhibited with hairpin siRNA at both the mRNA and protein level, the anticryptococcal activity of YT cells was dramatically reduced. Although the inhibition was not complete, this may have been due to the limitation of the transfection efficiency, which might explain the inability of siRNA to completely inhibit the constitutive expression of perforin. Our previous work has indicated that perforin did not contribute to the anticryptococcal activity of human CD8 CTL (13). Thus, human NK cells are more like mouse NK cells and distinct from human CD8 T cells in their anticryptococcal effector mechanism. Despite the observation that NK cells have granulysin, they do not appear to use it for anticryptococcal activity. We might ask why cells that express granulysin do not use it as do their counterparts, CD8 T cells. The reason for this is not apparent, but might include: 1) it is possible that the receptors on NK cells and CD8 T cells for the ligand on C. neoformans may be different, which would trigger different intracellular events that result in different use of effector molecules; 2) although the same receptor might be used, different coreceptors or different accessory molecules might stimulate different signaling pathways; 3) different signaling pathways, which regulate the cytotoxic granule expression, movement, and release, may be used in NK cells and CD8 T cells; 4) NK cells and CD8 T cells have their own unique set of molecules to facilitate the final release of perforin and granulysin to the target, respectively. There are examples of each of these mechanisms in different cellular responses. For example, CXCR4 has considerable conformational heterogeneity that has been proposed to explain the differences in HIV binding and uptake in different cell types (61). Alternatively, androgen has profoundly disparate effects in different cell types, depending on the expression of coreceptors such as steroid receptor coactivator-1 (62) or breast cancer susceptibility gene 1 (63). In this regard, it is notable that NK cells have both transmembrane adaptor proteins DAP10 and DAP12, which are used by stimulatory receptors, while CD8 T cells have only DAP10 (64, 65). Finally, despite using the same receptor and coreceptors, LPS stimulates quite different responses in mast cells compared with PBMC. LPS stimulates mast cells to express IL-5, CCL5, and CCL1, which would recruit Th2 cells and eosinophils. By contrast, PBMC do not express these genes (66). It also has been established that granulysin can function independently of perforin in human CD8 CTL (13). After observing that perforin, but not granulysin, played a dominant role in the YT cell-mediated anticryptococcal activity, experiments were performed to determine whether perforin functions independently of granulysin. 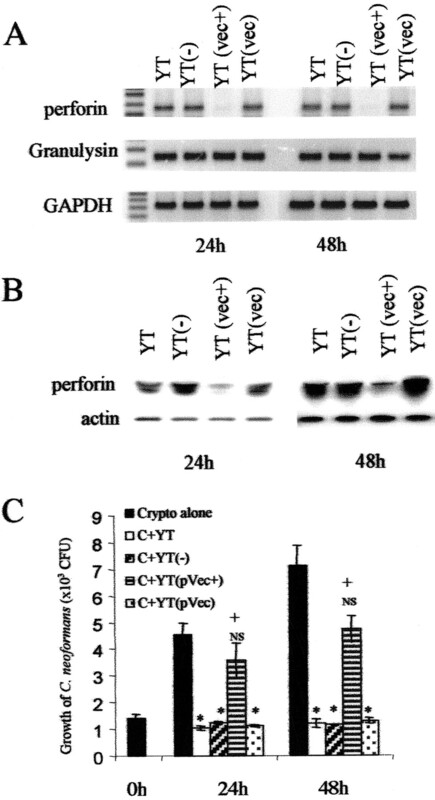 In the presence or absence of granulysin, as long as perforin was expressed, the anticryptococcal activity of YT cells did not significantly change, suggesting perforin worked independently of granulysin. Based on these results, granulysin and perforin are independent of each other in the anticryptococcal activity of human CD8 T lymphocytes and YT cells. However, in some circumstances, when the microbial pathogen is intracellular, for example Mycobacterium tuberculosis, granulysin needs perforin to gain the access to the intracellular compartment (4). This is quite different from the anticryptococcal activity displayed by CD8 T lymphocyte and NK cells, in which the effector cells are in direct contact with the extracellular microbial target. In this circumstance, perforin and granulysin function independently in direct microbial host defense. A number of groups have studied the role of NK cells in the host defense against C. neoformans in vivo. The process of NK cell-mediated fungisasis requires binding to the yeast cell. Binding is followed by release of NK cell cytolytic components (perforin), resulting in yeast cell death (48, 60). NK cell granules contain cytolysin, which can kill C. neoformans (26, 60). Murine NK cells appears to exert direct toxicity to the yeast cell (26). Studies from beige mice, which have defects in NK cell activity, also suggest that depletion of NK cells can alter the course of i.v. C. neoformans infection in mice (67, 68, 69). Furthermore, the mouse studies consistently show that NK cell depletion can result in increased lung CFU at early times after i.v. infection in vivo (69). Thus, all of these studies indicate the important role for NK cells in the host defense against C. neoformans in vivo in the murine system. The present study extends the previous observations from mouse to human, and shows that human NK cells possess perforin-mediated anticryptococcal activity. In summary, we have examined the mechanism of NK-mediated anticryptococcal activity by using a human NK cell line, YT cells. In all of the experiments that could be done in primary NK cells, the mechanism of anticryptococcal activity was the same as in YT cells. Our results indicate that NK-mediated anticryptococcal activity was cell contact dependent and cytotoxic granule dependent. Using siRNA-mediated RNAi, we found that perforin, but not granulysin, played a dominant role in NK-mediated anticryptococcal activity, and it is independent of granulysin. This is in direct contrast to the mechanisms used by human CD8 CTL. We thank Dr. J. P. Deans for her helpful discussion and encouragement. We thank Drs. D. Hart and J. F. Wang for their lab’s technical assistance, and T. Hately for secretarial services. ↵1 This work was supported by grants from the Canadian Institutes for Health Research, the Canadian Foundation for AIDS Research, and the Alberta Lung Association. C.H.M. is the Jessie Bowden Lloyd Professor of Immunology and a Senior Scholar of the Alberta Heritage Foundation for Medical Research. L.L.M. is supported by a studentship from Alberta Lung Association. A.M.K. is the Shelagh Galligan Professor of Pediatrics. ↵3 Abbreviations used in this paper: siRNA, small interfering RNA; RNAi, RNA interference. Kagi, D., F. Vignaux, B. Ledermann, K. Burki, V. Depraetere, S. Nagata, H. Hengartner, P. Golstein. 1994. Fas and perforin pathways as major mechanisms of T cell-mediated cytotoxicity. Science 265:528. Wei, S., A. M. Gamero, J. H. Liu, A. A. Daulton, N. I. Valkov, J. A. Trapani, A. C. Larner, M. J. Weber, J. Y. Djeu. 1998. Control of lytic function by mitogen-activated protein kinase/extracellular regulatory kinase 2 (ERK2) in a human natural killer cell line: identification of perforin and granzyme B mobilization by functional ERK2. J. Exp. Med. 187:1753. Sayers, T. J., A. D. Brooks, J. K. Lee, R. G. Fenton, K. L. Komschlies, J. M. Wigginton, R. Winkler-Pickett, R. H. Wiltrout. 1998. Molecular mechanisms of immune-mediated lysis of murine renal cancer: differential contributions of perforin-dependent versus Fas-mediated pathways in lysis by NK and T cells. J. Immunol. 161:3957. Stenger, S., D. A. Hanson, R. Teitelbaum, P. Dewan, K. R. Niazi, C. J. Froelich, T. Ganz, S. Thoma-Uszynski, A. Melian, C. Bogdan, et al 1998. An antimicrobial activity of cytolytic T cells mediated by granulysin. Science 282:121. Andreu, D., C. Carreno, C. Linde, H. G. Boman, M. Andersson. 1999. Identification of an anti-mycobacterial domain in NK-lysin and granulysin. Biochem. J. 344:845. Pena, S. V., A. M. Krensky. 1997. Granulysin, a new human cytolytic granule-associated protein with possible involvement in cell-mediated cytotoxicity. Semin. Immunol. 9:117. Hanson, D. A., A. A. Kaspar, F. R. Poulain, A. M. Krensky. 1999. Biosynthesis of granulysin, a novel cytolytic molecule. Mol. Immunol. 36:413. Kaspar, A. A., S. Okada, J. Kumar, F. R. Poulain, K. A. Drouvalakis, A. Kelekar, D. A. Hanson, R. M. Kluck, Y. Hitoshi, D. E. Johnson, et al 2001. A distinct pathway of cell-mediated apoptosis initiated by granulysin. J. Immunol. 167:350. Ernst, W. A., S. Thoma-Uszynski, R. Teitelbaum, C. Ko, D. A. Hanson, C. Clayberger, A. M. Krensky, M. Leippe, B. R. Bloom, T. Ganz, R. L. Modlin. 2000. Granulysin, a T cell product, kills bacteria by altering membrane permeability. J. Immunol. 165:7102. Dismukes, W. E.. 1988. Cryptococcal meningitis in patients with AIDS. J. Infect. Dis. 157:624. Coker, R. J.. 1992. Cryptococcal infection in AIDS. Int. J. STD AIDS 3:168. Perfect, J. R., D. L. Granger, D. T. Durack. 1987. Effects of antifungal agents and γ interferon on macrophage cytotoxicity for fungi and tumor cells. J. Infect. Dis. 156:316. Ma, L. L., J. C. Spurrell, J. F. Wang, G. G. Neely, S. Epelman, A. M. Krensky, C. H. Mody. 2002. CD8 T cell-mediated killing of Cryptococcus neoformans requires granulysin and is dependent on CD4 T cells and IL-15. J. Immunol. 169:5787. Obata-Onai, A., S. Hashimoto, N. Onai, M. Kurachi, S. Nagai, K. Shizuno, T. Nagahata, K. Matsushima, K. Mathushima. 2002. Comprehensive gene expression analysis of human NK cells and CD8+ T lymphocytes. Int. Immunol. 14:1085. Jongstra, J., T. J. Schall, B. J. Dyer, C. Clayberger, J. Jorgensen, M. M. Davis, A. M. Krensky. 1987. The isolation and sequence of a novel gene from a human functional T cell line. J. Exp. Med. 165:601. Houchins, J. P., F. Kricek, C. S. Chujor, C. P. Heise, T. Yabe, C. McSherry, F. H. Bach. 1993. Genomic structure of NKG5, a human NK and T cell-specific activation gene. Immunogenetics 37:102. Podack, E. R.. 1999. How to induce involuntary suicide: the need for dipeptidyl peptidase I. Proc. Natl. Acad. Sci. USA 96:8312. Santoli, D., G. Trinchieri, H. Koprowski. 1978. Cell-mediated cytotoxicity against virus-infected target cells in humans. II. Interferon induction and activation of natural killer cells. J. Immunol. 121:532. Godeny, E. K., C. J. Gauntt. 1986. Involvement of natural killer cells in coxsackievirus B3-induced murine myocarditis. J. Immunol. 137:1695. Ching, C., C. Lopez. 1979. Natural killing of herpes simplex virus type 1-infected target cells: normal human responses and influence of antiviral antibody. Infect. Immun. 26:49. Orange, J. S., C. A. Biron. 1996. Characterization of early IL-12, IFN-αβ, and TNF effects on antiviral state and NK cell responses during murine cytomegalovirus infection. J. Immunol. 156:4746. Welsh, R. M., Jr. 1978. Cytotoxic cells induced during lymphocytic choriomeningitis virus infection of mice. I. Characterization of natural killer cell induction. J. Exp. Med. 148:163. Biron, C. A., K. S. Byron, J. L. Sullivan. 1989. Severe herpesvirus infections in an adolescent without natural killer cells. N. Engl. J. Med. 320:1731. Scharton-Kersten, T. M., A. Sher. 1997. Role of natural killer cells in innate resistance to protozoan infections. Curr. Opin. Immunol. 9:44. Hidore, M. R., N. Nabavi, C. W. Reynolds, P. A. Henkart, J. W. Murphy. 1990. Cytoplasmic components of natural killer cells limit the growth of Cryptococcus neoformans. J. Leukocyte Biol. 48:15. Mody, C. H., G. B. Toews, M. F. Lipscomb. 1988. Cyclosporin A inhibits the growth of Cryptococcus neoformans in a murine model. Infect. Immun. 56:7. Mody, C. H., C. J. Wood, R. M. Syme, J. C. Spurrell. 1999. The cell wall and membrane of Cryptococcus neoformans possess a mitogen for human T lymphocytes. Infect. Immun. 67:936. Quan, P. C., T. Ishizaka, B. R. Bloom. 1982. Studies on the mechanism of NK cell lysis. J. Immunol. 128:1786. Neighbour, P. A., H. S. Huberman. 1982. Sr++-induced inhibition of human natural killer (NK) cell-mediated cytotoxicity. J. Immunol. 128:1236. Kida, Y., K. Kuwano, Y. Zhang, S. Arai. 2001. Acholeplasma laidlawii up-regulates granulysin gene expression via transcription factor activator protein-1 in a human monocytic cell line, THP-1. Immunology 104:324. Kolkowski, E. C., P. Reth, F. Pelusa, J. Bosch, R. Pujol-Borrell, J. Coll, D. Jaraquemada. 1999. Th1 predominance and perforin expression in minor salivary glands from patients with primary Sjogren’s syndrome. J. Autoimmun. 13:155. Mody, C. H., R. Paine, III, C. Jackson, G. H. Chen, G. B. Toews. 1994. CD8 cells play a critical role in delayed type hypersensitivity to intact Cryptococcus neoformans. J. Immunol. 152:3970. Levitz, S. M., M. P. DuPont. 1993. Phenotypic and functional characterization of human lymphocytes activated by interleukin-2 to directly inhibit growth of Cryptococcus neoformans in vitro. J. Clin. Invest. 91:1490. Levitz, S. M., T. P. Farrell, R. T. Maziarz. 1991. Killing of Cryptococcus neoformans by human peripheral blood mononuclear cells stimulated in culture. J. Infect. Dis. 163:1108. Stenger, S., R. J. Mazzaccaro, K. Uyemura, S. Cho, P. F. Barnes, J. P. Rosat, A. Sette, M. B. Brenner, S. A. Porcelli, B. R. Bloom, R. L. Modlin. 1997. Differential effects of cytolytic T cell subsets on intracellular infection. Science 276:1684. Foreman, J. C.. 1977. Spontaneous histamine secretion from mast cells in the presence of strontium. J. Physiol. 271:215. Scharton, T. M., P. Scott. 1993. Natural killer cells are a source of interferon γ that drives differentiation of CD4+ T cell subsets and induces early resistance to Leishmania major in mice. J. Exp. Med. 178:567. Trinchieri, G.. 1993. Interleukin-12 and its role in the generation of TH1 cells. Immunol. Today 14:335. Ewen, C., K. P. Kane, I. Shostak, P. J. Griebel, E. M. Bertram, T. H. Watts, R. C. Bleackley, J. E. McElhaney. 2003. A novel cytotoxicity assay to evaluate antigen-specific CTL responses using a colorimetric substrate for granzyme B. J. Immunol. Methods 276:89. Young, J. D., L. G. Leong, C. C. Liu, A. Damiano, Z. A. Cohn. 1986. Extracellular release of lymphocyte cytolytic pore-forming protein (perforin) after ionophore stimulation. Proc. Natl. Acad. Sci. USA 83:5668. Levitz, S. M., M. P. DuPont, E. H. Smail. 1994. 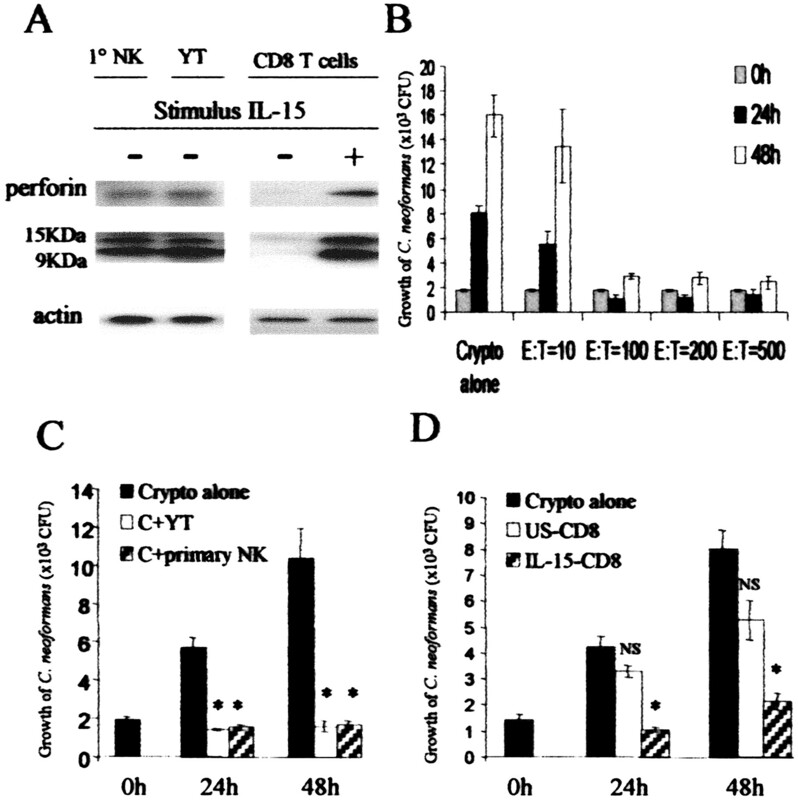 Direct activity of human T lymphocytes and natural killer cells against Cryptococcus neoformans. Infect. Immun. 62:194. Nabavi, N., J. W. Murphy. 1985. In vitro binding of natural killer cells to Cryptococcus neoformans targets. Infect. Immun. 50:50. Hidore, M. R., J. W. Murphy. 1989. Murine natural killer cell interactions with a fungal target, Cryptococcus neoformans. Infect. Immun. 57:1990. Murphy, J. W., M. R. Hidore, N. Nabavi. 1991. Binding interactions of murine natural killer cells with the fungal target Cryptococcus neoformans. Infect. Immun. 59:1476. Murphy, J. W., M. R. Hidore, S. C. Wong. 1993. Direct interactions of human lymphocytes with the yeast-like organism, Cryptococcus neoformans. J. Clin. Invest. 91:1553. Montgomery, M. K., S. Xu, A. Fire. 1998. RNA as a target of double-stranded RNA-mediated genetic interference in Caenorhabditis elegans. Proc. Natl. Acad. Sci. USA 95:15502. Fire, A., S. Xu, M. K. Montgomery, S. A. Kostas, S. E. Driver, C. C. Mello. 1998. Potent and specific genetic interference by double-stranded RNA in Caenorhabditis elegans. Nature 391:806. Tabara, H., A. Grishok, C. C. Mello. 1998. RNAi in C. elegans: soaking in the genome sequence. Science 282:430. Voinnet, O., P. Vain, S. Angell, D. C. Baulcombe. 1998. Systemic spread of sequence-specific transgene RNA degradation in plants is initiated by localized introduction of ectopic promoterless DNA. Cell 95:177. Waterhouse, P. M., M. W. Graham, M. B. Wang. 1998. Virus resistance and gene silencing in plants can be induced by simultaneous expression of sense and antisense RNA. Proc. Natl. Acad. Sci. USA 95:13959. Kennerdell, J. R., R. W. Carthew. 1998. Use of dsRNA-mediated genetic interference to demonstrate that frizzled and frizzled 2 act in the wingless pathway. Cell 95:1017. Misquitta, L., B. M. Paterson. 1999. Targeted disruption of gene function in Drosophila by RNA interference (RNA-i): a role for nautilus in embryonic somatic muscle formation. Proc. Natl. Acad. Sci. USA 96:1451. Ngo, H., C. Tschudi, K. Gull, E. Ullu. 1998. Double-stranded RNA induces mRNA degradation in Trypanosoma brucei. Proc. Natl. Acad. Sci. USA 95:14687. Elbashir, S. M., W. Lendeckel, T. Tuschl. 2001. RNA interference is mediated by 21- and 22-nucleotide RNAs. Genes Dev. 15:188. Kishi, A., Y. Takamori, K. Ogawa, S. Takano, S. Tomita, M. Tanigawa, M. Niman, T. Kishida, S. Fujita. 2002. Differential expression of granulysin and perforin by NK cells in cancer patients and correlation of impaired granulysin expression with progression of cancer. Cancer Immunol. Immunother. 50:604. Hidore, M. R., N. Nabavi, F. Sonleitner, J. W. Murphy. 1991. Murine natural killer cells are fungicidal to Cryptococcus neoformans. Infect. Immun. 59:1747. Baribaud, F., T. G. Edwards, M. Sharron, A. Brelot, N. Heveker, K. Price, F. Mortari, M. Alizon, M. Tsang, R. W. Doms. 2001. Antigenically distinct conformations of CXCR4. J. Virol. 75:8957. Spencer, T. E., G. Jenster, M. M. Burcin, C. D. Allis, J. Zhou, C. A. Mizzen, N. J. McKenna, S. A. Onate, S. Y. Tsai, M. J. Tsai, B. W. O’Malley. 1997. Steroid receptor coactivator-1 is a histone acetyltransferase. Nature 389:194. Yeh, S., Y. C. Hu, M. Rahman, H. K. Lin, C. L. Hsu, H. J. Ting, H. Y. Kang, C. Chang. 2000. Increase of androgen-induced cell death and androgen receptor transactivation by BRCA1 in prostate cancer cells. Proc. Natl. Acad. Sci. USA 97:11256. Gilfillan, S., E. L. Ho, M. Cella, W. M. Yokoyama, M. Colonna. 2002. NKG2D recruits two distinct adapters to trigger NK cell activation and costimulation. Nat. Immunol. 3:1150. Diefenbach, A., E. Tomasello, M. Lucas, A. M. Jamieson, J. K. Hsia, E. Vivier, D. H. Raulet. 2002. Selective associations with signaling proteins determine stimulatory versus costimulatory activity of NKG2D. Nat. Immunol. 3:1142. Okumura, S., J. Kashiwakura, H. Tomita, K. Matsumoto, T. Nakajima, H. Saito, Y. Okayama. 2003. Identification of specific gene expression profiles in human mast cells mediated by Toll-like receptor 4 and FcεRI. Blood 102:2547. Hidore, M. R., J. W. Murphy. 1986. Natural cellular resistance of beige mice against Cryptococcus neoformans. J. Immunol. 137:3624. Salkowski, C. A., E. Balish. 1991. Role of natural killer cells in resistance to systemic cryptococcosis. J. Leukocyte Biol. 50:151. Hidore, M. R., J. W. Murphy. 1986. Correlation of natural killer cell activity and clearance of Cryptococcus neoformans from mice after adoptive transfer of splenic nylon wool-nonadherent cells. Infect. Immun. 51:547.